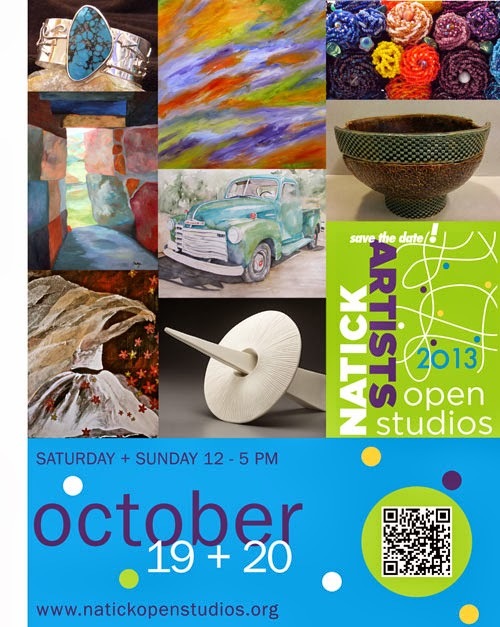 Natick Open Studios is celebrating it's 12th year this weekend, October 19th and 20th, from noon -5pm. This year, Open Studios will include painters, photographers, jewelery makers, ceramic artisans, sculptors, woodworkers as well as paper, fabric, glass and garden artists. Cody's Creations studio is located at 43 Main Street #2. At this location you will have a chance to meet some amazing artists: Liliana Bead with lampwork glass jewelery & sculpture, John Holtz with sterling silver jewelry, Deb Sayre with jewelry and mosaics, and Marie Craig with photography. At 5:30 on October 19th at 43 Main Street, David Zaltzberg will be giving a talk on the History of Stained Glass Restoration in North America. I am excited to participate in my first open studios. I hope that you will stop in and say hi! Please visit Natick Open Studios website for a full listing of all artists and events happening this weekend.